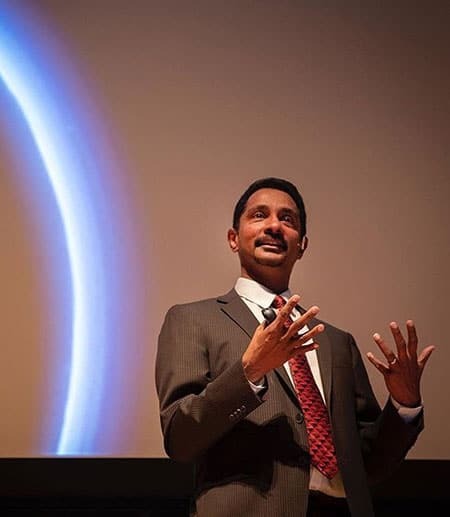 Drawing a picture of wonder with words, images and animations, Ray Jayawardhana shared his enthusiasm for astronomy’s “extraordinary age of discovery” with Cornell’s Trustee Council in a keynote address at the Annual Meeting Nov. 2. Jayawardhana, the Harold Tanner Dean of Arts and Sciences and professor of astronomy, reminded the packed Alice Statler Auditorium that just about 25 years ago only one planetary system – our own – was known, and it had nine planets. Since then, astronomers have discovered “a whole host of objects in the icy outskirts of our solar system,” he said, which led to the dramatic demotion of Pluto to a so-called dwarf planet. Jayawardhana highlighted a number of planetary science discoveries of recent decades, including evidence of past water flows on Mars, investigated by orbiting spacecraft as well as by what he called “the two Mars rovers ‘that could,’” for which Cornell’s Steve Squyres is principal investigator. “Scientists have brought back pristine samples from an asteroid and a comet,” Jayawardhana said. “Cassini mission has flown through icy plumes coming off Saturn’s moon Enceladus, and strengthened the case that a number of moons in the outer solar system contain sub-surface oceans. We’ve caught sunlight glinting off methane seas on Titan. “We’ve even captured close-up views of Pluto with the New Horizons spacecraft so that now we can marvel at its glaciers and many other splendors – rather than lament its identity crisis,” he added to laughter. And while these discoveries have stretched our imagination, Jayawardhana said, “the most amazing revelations” of the past decades have come from beyond our own solar system, with the identification of thousands of planets – including a handful in the so-called habitable zone – circling other suns. He remarked on the incredible diversity of planets and planetary systems discovered already. These exoplanet discoveries have not come easily, Jayawardhana explained, because the extreme brightness contrast between a star and a planet makes detection difficult. Even though astronomers have captured snapshots of a few massive planets circling young stars – including what he dubbed “a family portrait” of a four-planet system – the vast majority of exoplanets have been found through the wobble and the transit techniques. Jayawardhana described how astronomers – including postdoctoral researchers and students in his own group – have taken the first steps toward characterizing some of these alien worlds, “remote sensing across tens of light-years,” as he put it. They have traced the changing phases of exoplanets in some cases and discerned spectral fingerprints of atmospheric constituents in others. “Isn’t remarkable that we’re beginning to get to know these distant alien worlds as real places?” Jayawardhana asked. However, detecting compelling evidence of life on exoplanets remains a challenging proposition. That does not deter theorists such as Lisa Kaltenegger, director of Cornell’s Carl Sagan Institute, from modeling planetary biomarkers, nor does it stop instrument builders and observers from developing techniques that could pave the way, Jayawardhana said.